Description: A devastated Earth's last hope is found in Pearls: small, mysterious orbs that fall from space and are capable of supplying enough energy to power entire cities. Battling to control the Pearls are the Skyship dwellers -- political dissidents who live in massive ships in the Earth's stratosphere -- and the corrupt Surface government. Jesse Fisher, a Skyship slacker, and Cassius Stevenson, a young Surface operative, cross paths when they both venture into forbidden territory in pursuit of Pearls. Their chance encounter triggers an unexpected reaction, endowing each boy with remarkable -- and dangerous -- abilities that their respective governments would stop at nothing to possess. 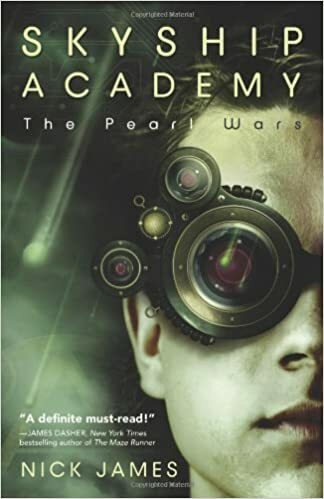 Enemies thrust together with a common goal, Jesse and Cassius make their way to the ruins of Seattle to uncover the truth about their new powers, the past they didn't know they shared, and a shocking secret about the Pearls. My Thoughts: This story is a science fiction dystopia. It features a corrupt earth government, Skyships of rebels, and aliens. In this future when the United States has been devastated by something and retaliated by nuking any perceived enemies, surface dwellers are divided into fringers and the residents of some protected cities. These cities are powered by pearls that fall from the sky and have enough energy to keep the cities going. The main characters are Jesse Fisher who has been raised on one of the skyships and is supposed to be training as one of the agents who are spies and soldiers. He's more interested in going to one of the other cities as soon as he turns eighteen. The other main character is Cassius Stevenson who has been raised on Earth under the control of the mysterious Madame who goal is to bring down the skyships. The boys first meet on earth in one of the abandoned cities when both are looking for a fallen pearl. When they touch each other something strange happens to each of them. Jesse develops the ability to call the pearls to him and to cause them to explode. Cassius gains the ability to explode spewing fire all around him. Cassius has no control over this ability but Madame says that she has the cure if only he goes to skyship academy and brings her Jesse. Jesse has plans of his own and wants to get to Seattle to find out about his mysterious past. This story is filled with action as both boys find themselves on Earth and making their way to Seattle. This is the first book in a series. I'll be reading more to find out more about Jesse and Cassius. I bow my head, getting lost in the Pearl energy, and try to convince myself the everything's fine. But I can't ignore the cruisers back in Lenbrg, or Cassius's grim determination to fine me. This isn't just some fancy scavenger hunt amidst the ruins. There are weapons involved. Armies. I should be worried. I should be mass worried.